During the time we were in USA I didn’t have time to add any new posts and since I got back home it’s been hectic with all sorts of activities going on which also has delayed me finding time to post anything here. Our first day on the road was in a rental car and getting that sorted out was a story in itself. There was no car available when we got there and the person behind the counter had great difficulties in helping us finally sending us out to look for a non-existent parking lot. Luckily, the guys out there were in better control of the situation and found us not only a car but gave some good recommendations for a route across LA towards Barstow which was our first planned stop. We were able to travel in the lane reserved for cars with two or more people in, which eased our journey across the metropolis considerably. 99% of the cars we saw just had one person in them. Our first stop was at Walmart, Barstow where we bought a petrol can, many liters of water and foodstuffs etc for the journey. At the checkout counter an American lady addressed us in Swedish and wondered how we had found the god forsaken hole of Barstow. It seems that she had lived in Eskilstuna for many years before returning to California. 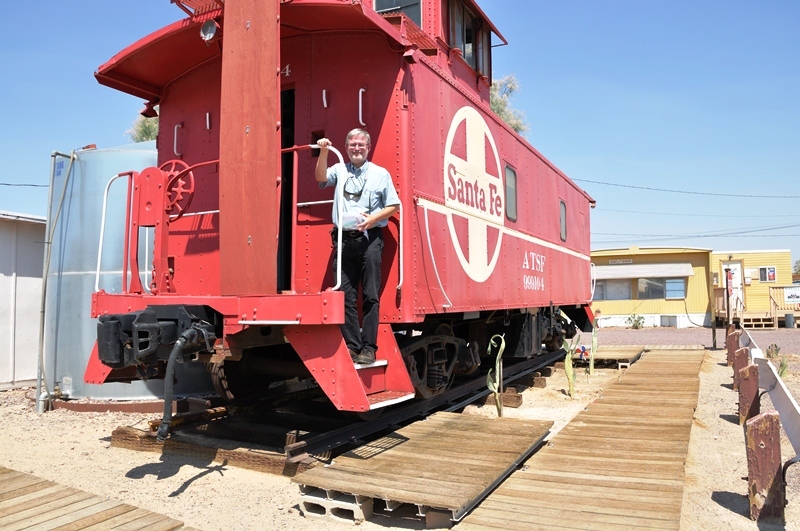 The first stop was at The Little Red Caboose making it the cache to give me a California souvenir. It was a fun cache in it’s own right. 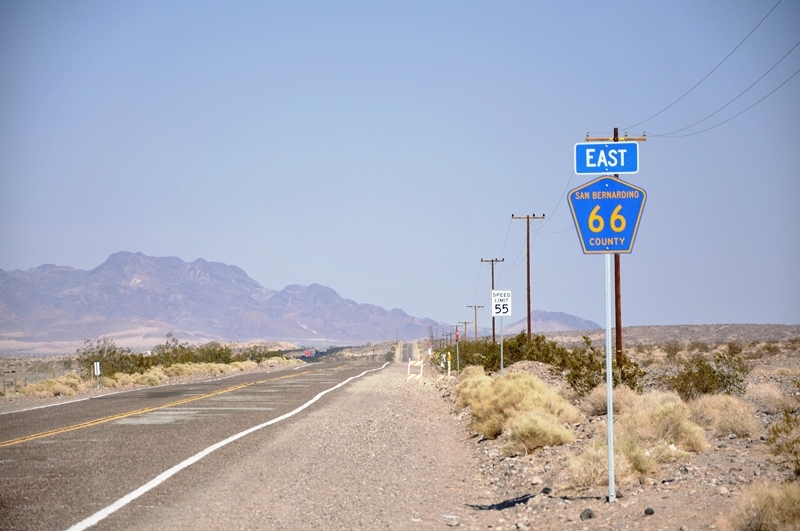 As we had more than 500km to drive to get to Las Vegas I had no intention of trying to find 800 caches on the Route 66 Power Trail. We did the first section which consisted of 33 caches. They were virtually all “PORC’s” or Pile Of Rock Caches. They were easy to locate but I had a moment at one of them when I heard what I am sure was a rattlesnake not too far away. I didn’t wait to find out if I had heard correctly. We drove up across the Mojave Nature Reserve to rejoin highway 15 an hours drive south of Las Vegas. I was expecting a desert with just sand but it was full of bushes, and areas with many Joshua trees. We glimpsed a coyote at one placed that we stopped but it was a disappointment that we weren’t in a classic desert with just sand dunes. We couldn’t complain about the heat though. 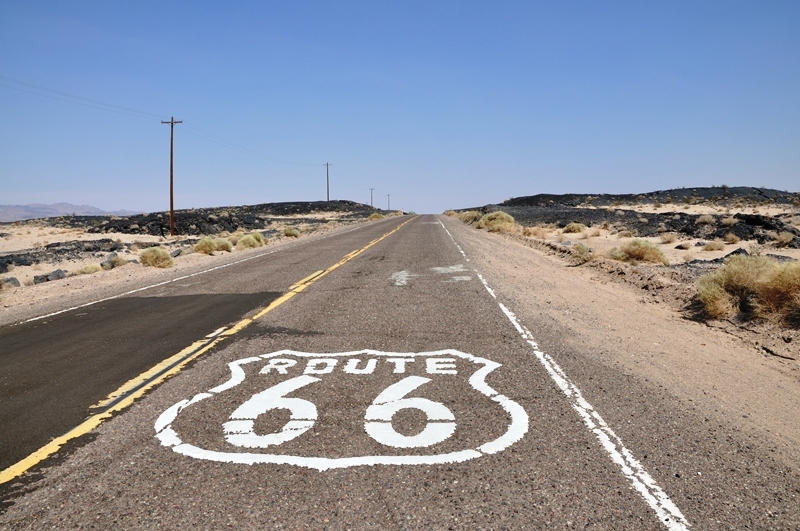 It was 40C in the shade and of course when I was doing the power trail on Route 66 there was none. Phew! 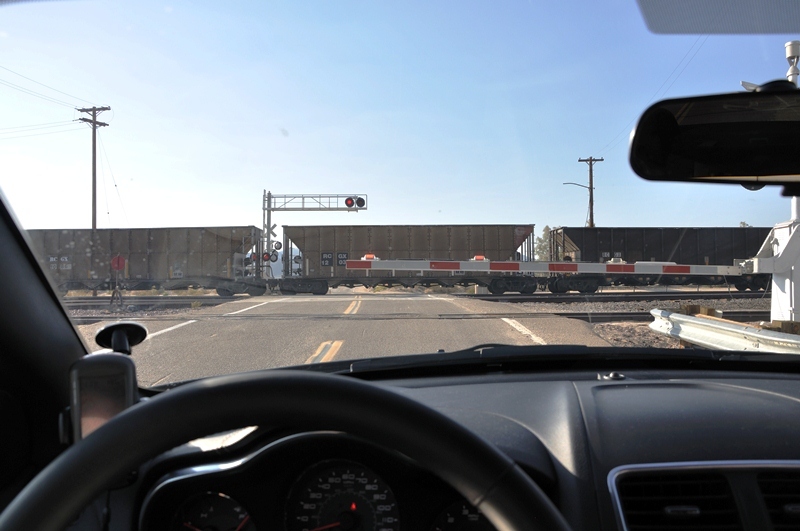 We logged a virtual cache in Kelso after waiting at the railroad crossing for a 3 km long train to pass. Arrived just in time to wait for a 3 kilometer long train to pass. We rolled into Las Vegas in the early evening after a long day in the car, and as we were staying there a couple of nights we decided to postpone the “Las Vegas Strip by night” experience to the next evening.